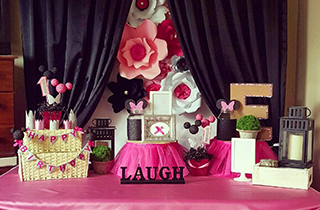 Lili’s Balloon Decorations is a company that can assist you in more ways that one when it comes to party decorating. No matter the event, big or small, we can provide you with full service decorating assistance to help turn your party into the scene you are wanting. There are many different things we can provide for you and many ways we can help you decorate on the day of your party. For one, since it is mentioned in our business name, we can provide you with any type of balloon decorations you are wanting. Whether you are looking to fill the room with balloons or place them sparingly throughout the venue, we can help with such. And we can help you create with the balloons, as well. If you are wanting a specific decoration such as a design or a bouquet, we can put them together however you please. We are also the place to come to for flower decorations. We have all types and sizes of flowers that can be used for a number of different occasions. When it comes to event decorations, we can give your venue a lovely flower decor. And not just for decorating, our flower service can be used in other ways such as custom flower arrangements for gifting purposes. Including the balloons and flowers we are known to provide, we can also help in any other party decoration aspects. We can create custom party supplies, help you create party favors and come through with any other party decorations you are needing. And with anything you are requesting to be provided, we will give you the full service of delivering our products and helping with the setup process. Make your next event as visually-pleasing as possible with the help of Lili’s Balloon Decorations.